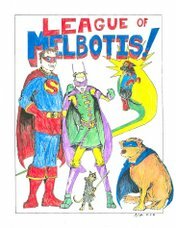 League of Melbotis: why does saying "caucus" make me giggle? why does saying "caucus" make me giggle? Well, I don't think this will be too shocking to know I voted Democrat in the Texas primary. Which means I also got off my duff and went to my local polling place for the caucus this evening. We showed up about 6:50ish, and wandered into a fairly crowded room. We were to begin caucusing after the polls officially closed. Not when they closed the doors at 7:00, but after the people running the poll down the hall decided they were done. So from 7:00 until 7:30, the room filled. And filled. And filled. Apparently the last time they did this, they had around a dozen people show up. I think we had, and this is sort of a guess... but I would guess around 500 people in the room. It was hot and sweaty. I had the passing thought about leaving. I was pretty sure my vote wasn't going to matter much in the grand scheme of things. But then I thought... Hey, I like me some democracy. I thought about the stories of people in other countries who get shot at on their way to vote, and who die for voting, and, well.. standing in a crowded room next to an annoying girl didn't seem like such a big deal. So I caucused. Tee hee! And while I am not sure my political apathy is completely gone, it seems voters in Travis County district 355 are all about the Democracy. And the chance to vote twice. Legally. Anyway, I will be curious to see the results in the morning, or whenever they shake out. Apparently Texas is still too close to call. I've always found "arsenal" leaves a smile on my face. Nobody can convince me that it isn't a dirty word. What is the proper salutation when someone votes? Congratulations doesn't seem quite right. Regardless, way to get out there and vote. That's 500 people actually IN the room. There was also a crowd of people in the door and hall, which we could see, and a rumored line around the building, which we could not. I wonder - what is the plural of caucus? Watchmen: Now younger and sexier!